It’s common to see vehicles (of all types, not just taxis) stopped in bus zones. 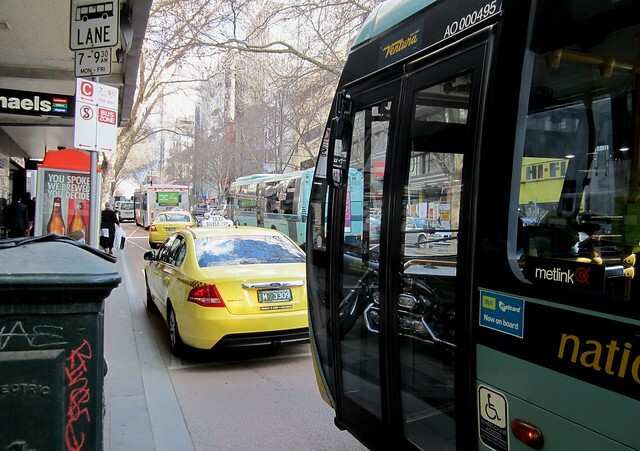 There seems to be little or no policing of this — no wonder this bus driver repeatedly beeped in vain waiting for the errant taxi to move, causing a delay to services along Melbourne’s busiest bus corridor, Lonsdale Street. And while other cities have fitted cameras to buses to ensure motorists doing the wrong thing are caught, there seem to be no such moves here.